Kendrick Press, Inc. (2007) vi, 153 pp. $60.00. The author, who is a Professor of Mathematics at Brigham Young University, gives a historical perspective of algebra, arithmetic, and geometry from ancient times up to the time of Gauss. A subsequent volume will treat more recent developments. The book is readily accessible to high school students and general readers. The material has been used in a popular and successful undergraduate course on the history of mathematics at BYU. The course unraveled some mysteries of mathematics for many students. Even math phobic students enjoyed this approach to the subject. 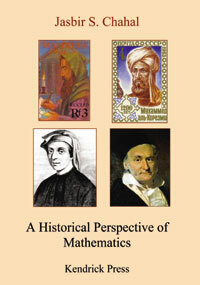 Chapter headings: Basic Arithmetic; Arithmetic in an Arbitrary Base; Basic Geometry; Greece: The Cradle of Theoretical Mathematics; Euclid: The Father of Theoretical Mathematics; Euclidean vs. Non-Euclidean Geometry; Euclid's Arithmetic; Fibonacci: His Time and His Legacy; Solution of the Cubic - A Simple Version of Cardano's Formula; Gauss and the Impossibility of Trisection of an Angle; Non-European Roots of Mathematics; Mathematical Anecdotes.